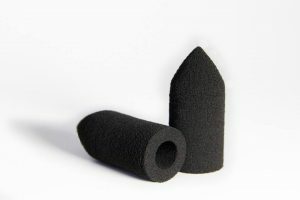 Beauty Blender and Silisponge are known by all make-up fans. For those of you who are oblivious as to what it is: these are sponges for make-up cosmetics application. They can easily replace brushes and other applicators. However, quite recently new gadget for make-up application has surfaced – The Make Up Bullet. You must try this exceptional and truly original sponge. The Make Up Bullet looks, well like a bullet. It has pointy end to easier reach these areas that are the most difficult to reach, like nose, corners of the lips and eyes area. What is more, this new gadget is truly easy in use. You just put it on the finger and perform the make-up. The Make Up Bullet is suitable for application of both liquid and loose products. It was made of material that is friendly to the skin; can be used by people with sensitive skin of face. How to speed up make-up? If each morning you are in hurry for the work and perform your make-up in a rush, then The Make Up Bullet will come handy to you. Buy several sponges and put each of them on fingers. Dip all of them in the foundation, then apply it on skin. Your make-up is ready in just few minutes. Remember to always clean The Make Up Bullet on regular basis. After executing make-up just wash it under running water, use soap or make-up remover. Excess water wring out and dry applicator in a warm place. Do not place it on the radiator; heat causes bacteria to proliferate. You can wring out the water from sponge with a paper towel. Did you know that you can perform wet make-up with The Make Up Bullet? Prior to the application wet the sponge then take some foundation or powder. The effect you gain will be truly stunning. Your make-up will become much more beautiful, will last longer on face and all imperfections will be 100% camouflaged.